• Ecosystem-based adaptation focuses on protecting and strengthening biodiversity and ecosystem services as a key adaptation strategy. The emphasis is thus on ensuring the sustainable management, conservation and restoration of ecosystems that people depend on. • Community-based adaptation puts community members at the centre of adaptation planning, enabling them to identify their own needs, set priorities, and find solutions based on their own knowledge and capacities. A key focus here is to empower communities to adapt. Each of these approaches has valuable benefits, but very often they are used in isolation: one or the other, even though both have elements that are crucial to rural communities. Thus, in recent years, there has been growing interest in integrating the two. This briefing note (download available in right-hand column or via links under further resources) describes lessons learned from the integration of both approaches in the EcoAdapt project. EcoAdapt’s work was anchored in Model Forests in each of the landscapes. First developed in the 1990s, the Model Forests approach aims to address the communities’ social, cultural and economic needs while ensuring the long-term sustainability of large landscapes in which forests are an important feature. Model Forests are broad-based initiatives covering forests, farms, protected areas, rivers and towns. In EcoAdapt, scientists and civil society organizations working in the Model Forests collaborated to explore water governance issues in the context of local development and in the face of climate variability and change. Using a bottom-up process, the project facilitated the co-generation and sharing of knowledge among scientists and diverse stakeholders operating across scales and policy areas. In all three sites, ecosystem-based adaptation strategies have been implemented alongside processes with a community-based adaptation component. The pilot activities chosen were tailored to each context – there is no “one size fits all” – and the time- frames and scales also varied. Table 1 offers some examples. What are the benefits of integrating both approaches? Community ownership: Directly involving community members in the adaptation planning process, drawing on local knowledge, and strengthening local leadership groups have all helped build local ownership of the adaptation processes. This will also make the strategies more sustainable over time (e.g. farmers’ cooperatives in Jujuy), especially because local actors have been involved since the beginning of the project. Linking people and nature: The integration of both approaches has highlighted the interconnections between different socio-ecological systems. This has raised the environmental awareness of community members and other local actors, leading them to value ecosystems more highly, building knowledge and enhancing adaptive capacity. Seeing the big picture: Where community-based adaptation highlights local issues and concerns, the ecosystem perspective links them with processes and changes taking place on a larger scale. This is particularly relevant where actions or impacts in one place affect resources and ecosystem services in another – such as when poor watershed management leads to water scarcity or poor water quality downstream. Clarifying different perspectives: Differences in concepts, perspectives and terminology can hinder communication among different actors. Bringing people together to share their perspec- tives and knowledge can help build a shared understanding of the issues and identify common interests. Furthermore, by tackling ecosystems functions, goods and services together, this approach helps to provide a holistic view of problems and solutions, including the multiple actors and institutional collaborations needed for successful adaptation. What have been the challenges in achieving more systemic solutions? Waning motivation: Keeping everyone motivated throughout the adaptation process, especially at the community level, remains difficult. Limited technical capacity and knowledge among key local actors contributes to this problem. Sustained engagement is crucial, however, because the pilot actions only address a fraction of the problems faced by these communities, sectors and ecosystems. 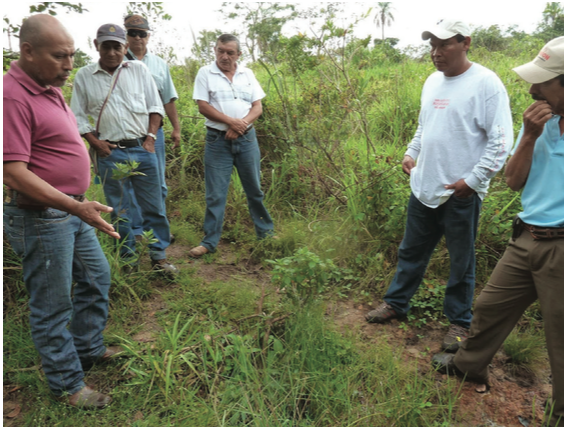 Effective and inclusive participation is still challenging: For example, in Bolivia, cattle ranchers have shown little interest in participating in the adaptation planning process. This is particu- larly problematic because cattle ranchers are seen as the main contributors to the loss of ecosystem functions and services. They are also the actors with highest economic and territorial influence in the Chiquitania region. Weak and often-changing public sector: The public sector is not always well positioned to contribute to adaptation processes, and turnover in government agencies can be high, which is a particular concern with officials who play key roles as change agents. Lack of transparency, cronyism, and corruption are also common problems, and they affect the credibility of adaptation processes. Power imbalances and mismatch between scales: A frequent mismatch between different governance layers, affects the interplay between them. This is characterized by a diverse landscape of actors with different mandates across geographic scales, and is experienced in many countries around the world, but more notably in developing countries. Balancing long-term with short-term needs: Communities and governments often prioritize their more immediate needs, but strengthening ecosystems and adapting to climate change both generally involve longer time frames. The larger the scale we work at, the more challenging is to resolve these conflicts, as there are more actors – and interests – involved. What else is needed for successful adaptation up-scaling and out-scaling? Linking ecosystem- and community-based approaches requires adopting a socio-ecological systems approach to adaptation to climate change. This means that not only the role of communities, institutions, and human rights and needs have to be taken into account, but also ecosystem functions, goods and services. Through EcoAdapt, we have used the Model Forests as platforms to build partnerships between scientists and civil society to co-produce knowledge around ecosystem services and water governance. Successful adaptation also requires securing finance, establishing supportive public policies, and integrating adaptation in resource planning processes. When these complementary processes are in place, they can reinforce one another and make adaptation decision-making more efficient and effective. Finally, it is important to develop accessible tools, support teams and networks to empower local actors. Approaches such as farmer field schools and “training of trainers” could facilitate up-scaling and replication of these actions elsewhere.